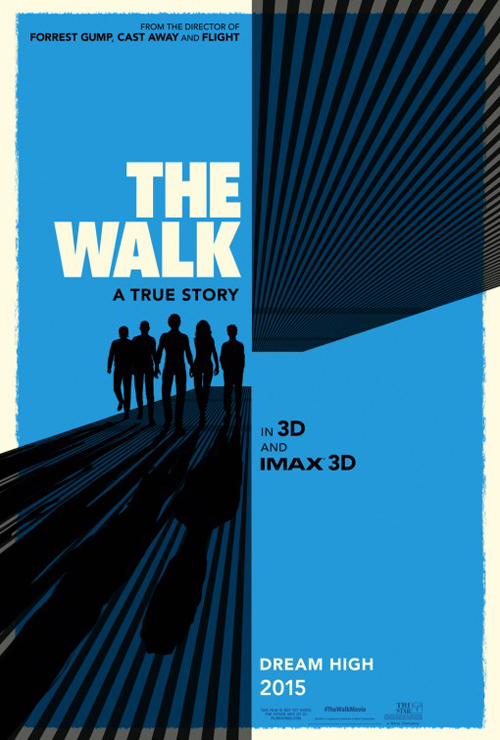 (SPOILERS) The first half hour of The Walk is so tonally at a loss, I feared the entire movie would be a bust. Robert Zemeckis mistakes the France-set, laboured scene-setting antics of Phillippe Petit (Joseph Gordon-Levitt) for disarming charm and a zesty tone. This, combined with Gordon-Levitt’s ‘Allo ‘Allo! French accent, suggests a fundamental miscalculation from the bottom up, a blunder as inadvisable as its director’s decision to spend a decade in world of motion capture. Fortunately, once the picture is on the safer ground of the “heist” (or “coup”, as Petit refers to it), the same high wire navigated by James Marsh’s superior doc Man on Wire, only here with added the visuals, natural momentum kicks in. This is ironic, as one of the drawbacks of Man on Wire was that, while it effectively communicated Petit’s passion and obsession, it didn’t shine much of a light on who the participants were as people. While The Walk also fails to delve into who Petit and co became since (one particularly wonders about Barry Greenhouse, the insurance executive who facilitated their access), the early section attempts to grant Petit a biography, and it flounders completely. Partly, it just isn’t very interesting; so he was a street performer (including some excruciatingly unfunny mime bit between Petit and his to-be girlfriend Annie Allix, played by Charlotte Le Bon), and his parents threw him out, and he meets up with Ben Kingsley, as most people do at some point if they’re in movies for long enough. His spark to cross the Twin Towers on a wire is similarly forced, and all the while Gordon-Levitt’s over-cajoling narration has exactly the opposite effect of persuading us this character has a story worth sticking around for. It’s easy to see why Zemeckis went down the heightened route of presentation and flourish, complete with a very artificially staged Petit “standing” atop the Statute of Liberty to deliver his account. Man on Wire is, after all highly theatrical, for all its documentary status, with re-enactments and a thriller structure, and the lion’s share of that is down to Petit’s persona as the central force (to be fair to the director, he states he began developing this project a decade ago, before Man on Wire came to be, but comparisons, and no doubt influences, are inevitable). But the result is off-puttingly broad, closer to Death Becomes Her’s mugging than keeping the foot on the ground it needs. That is, until Petit arranges his test exercise, traversing Notre Dame Cathedral (the follow-up, Sydney Harbour Bridge, is omitted, probably because three such feats would feel like diminishing returns). While Zemeckis and co-screenplay writer Christopher Browne, adapting Petit’s To Reach the Clouds, have slightly sexed up the tale (mainly through compressing the time it took to tease the plan out – three trips to New York were necessary, although the apparent detour to go back and see Ben Kingsley’s Papa Rudy for some advice, complete with scale models of the edifices, is bizarre – but also such dramatic devices as giving him a bleeding foot during the walk, and the shaking of the wire right at the end), for the most part it’s unnecessary to doctor the facts. One point they don’t include is the victorious Petit ungallantly opting for a celebratory shag with a passing groupie, probably sensible as it wouldn’t foster sympathy for the protagonist. Of which, Gordon-Levitt is naturally more winning a presence than the real Petit, able to convert the arrogance into something more personable. As such, Zemeckis could perhaps have pushed a bit more; we are told that Petit isn’t showing his co-conspirators due deference, rather than really seeing it, and this is dealt with through the clumsy comedy of Petit waking them up in the night and thanking them (mid-nailing up his “coffin”, amidst pre-performance anxiety); it’s hard to marry this kind of whacky guy schtick with the smooth, expertly staged laughs of Back to the Future. Le Bon rather disappears into mix, while Kingsley is Kingsley, commanding and dependable. Of Petit’s French chums acrophobic Jeff (César Domboy), who accompanies him to the rooftop, comes off best. Not so well-conceived is Benedict Samuel’s goofy stoner, so over-the-top it’s like Zemeckis never saw the ‘60s himself (or perhaps it’s because he did). The standouts are Valentine, complete with extraordinary goatee and gleefully white-collar rebel bent, and James Badge Dale’s local fixer Jean-Pierre, returning to the Zemeckis fold post-Flight and sporting a ridiculous perm. After a run where Gordon-Levitt appeared able to do no wrong, The Walk at least shows up that he’s merely human. His natural charm is buried in there, but the surface trappings are frequently embarrassing or misjudged. In attempting to capture Petit’s enthusiasm and bon homie he goes too big, and his look is unnecessarily artificial. But that suits Zemeckis these days, unfortunately. He appears to approach a project with the technical specs in mind first, even now he’s back in live action (God knows how that Yellow Submarine picture would have turned out). Do we really need to see the steel rope forming between the Towers, through the miracle of Petit’s CGI-imagining, in the near-last shot? But in terms of the vertiginous feats, the real attraction to the director, he doesn’t fail. 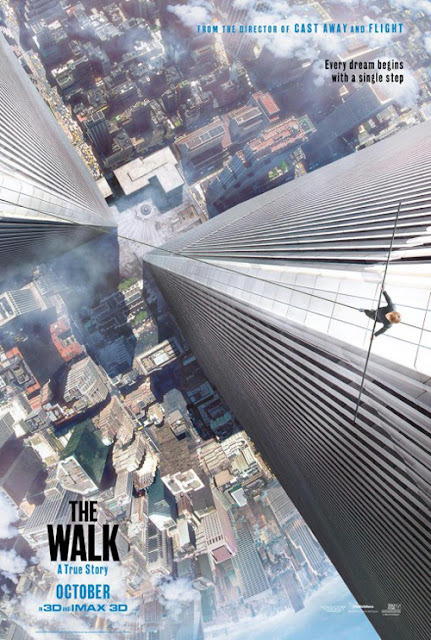 I was surprised to learn (I saw this in 2D, and it’s still fairly on-the-ledge; I don’t think I needed extra heady heights) this wasn’t a natural-3D movie, given Zemeckis’ thrall to all innovations technological (often at the expense of content), but no. The extreme craziness of Petit’s feat is only compounded as we breathe a sigh of relief on the completion of his crossing. Only for him to go back out for more. And more. Including all manner of insane poses; looking down, lying down, kneeling down, saluting his audience, taking up ballet poses. Sheer madness (he did eight crossings in all over 45 minutes, and Zemeckis certainly succeeds in telegraphing that he was out there for a good long while). Unlike Man on Wire, Zemeckis, as a man partial to sentiment (though thankfully not as much as his sometime mentor Spielberg), can’t resist invoking 9/11. So Petit, who is garlanded with the accolade of breathing life into edifices no one was particularly partial to previously, wistfully notes he was granted a pass “forever” to visit the observation decks of the Towers. Man on Wire was a minor hit in 2008 (relatively, for a documentary, one which won the Best Documentary Feature Oscar). It’s now twice that time since 9/11, and the tepid audience reception greeting The Walk suggests maybe people are tired of being reminded of an event that has, entirely for ill, informed the 21st century paradigm to date (unless it’s Back to the Future predicting it, of course; then it will get millions of hits on YouTube). Or perhaps it’s just that The Walk, when it settles in, is an engrossing but flawed picture, and anyone interested in the story has probably already read or heard Petit’s first-hand account.